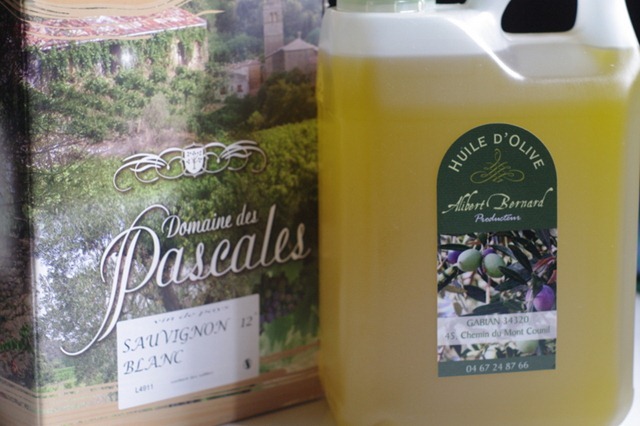 I went out shopping this morning and bought white wine from the Domaine des Pascales and olive oil from the Moulin de Casso, both in the village. Anyone with romantic images in their mind of old stone grinding the olives might be disappointed, but this is what an olive mill looks like now. 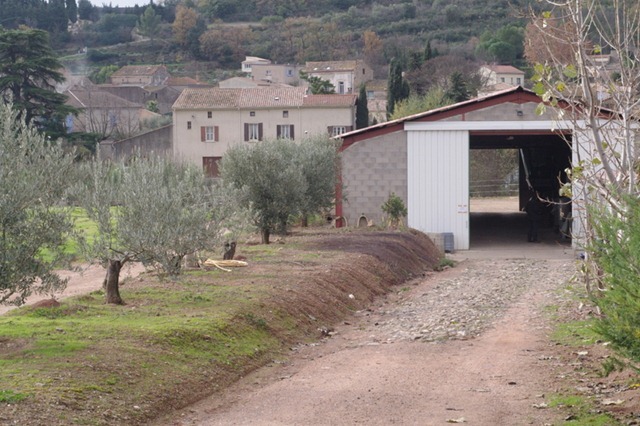 Inside the modern agricultural building there is a small modern olive press, gleaming metalically, while olive growers bring trailers of containers of olives for milling, driving through and out at the other end after dropping off their cargo. There are more photos of the mill, posted when it first opened two years ago, here. This year hasn’t been a good one for the olive crop, here in the Languedoc or in other areas around the Mediterranean, so I hope we don’t run out! The mill had enough left for me to buy a 2-litre bottle. Although I use the more plentiful and cheaper Spanish oil for cooking, it’s nice to have a local and very tasty one for salads. The white wine is a stand-by, always in our fridge for cooking and sometimes for drinking. Today I used it to poach some pears for dessert this evening when we have friends coming for supper. I’m soaking some saffron threads to stir into crème fraîche to go with them. The rest of the menu, dishes which I won’t photograph because we’ll have friends waiting to eat them, will be foie gras that we preserved in jars after our trip to the Gers last March, pork carbonade slow-cooked with onions, tomatoes, garlic and olives, served with baked potatoes, and then cheese before the poached pears. These mushrooms count as local, or fairly local anyway. They were given to us by a friend who’d been given them by a friend of his who had picked a lot. So it’s third-hand foraging. 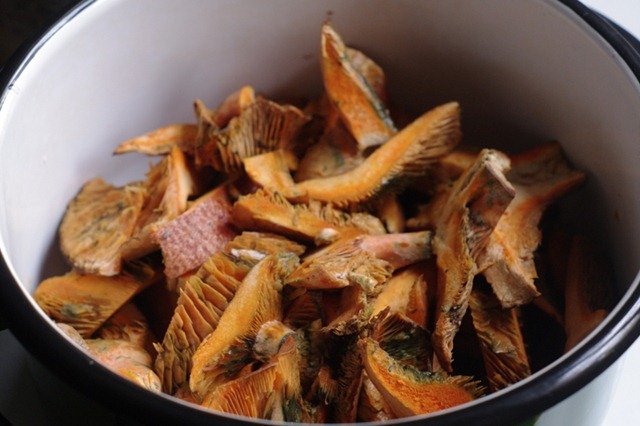 They are Lactarius deliciosus, Saffron Milk cap as they are known in English. From my point of view, one of their great advantages is that there is, apparently, no poisonous variety with which they can be confused. 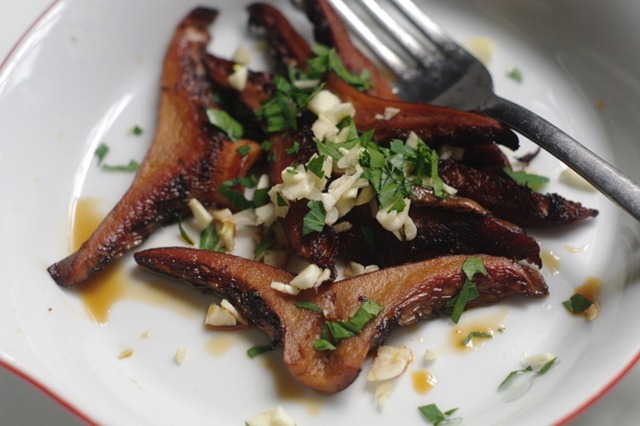 They’re good simply fried in olive oil and served with chopped garlic and parsley. But we had far to many to eat them all like that, so I decided to pickle the rest. 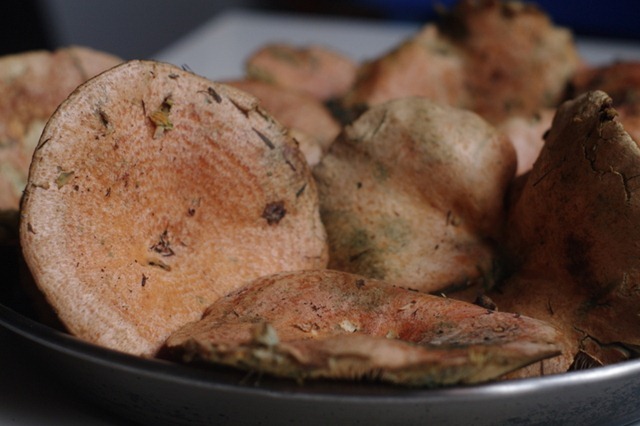 I sliced them, put them in water and simmered with a couple of paprika peppers until they were soft – these took about half an hour, but other kinds of more delicate mushrooms would cook much more quickly. While they were cooking I mixed 1 cup of white wine vinegar, 1 cup of water and 1 1/2 cups of sugar, added some bay leaves and some peppercorns, brought the mixture to the boil and simmered for about 10 minutes. I sterilised some glass jars in the oven (10 minutes at 140 C) and the seals in the some boiling water. 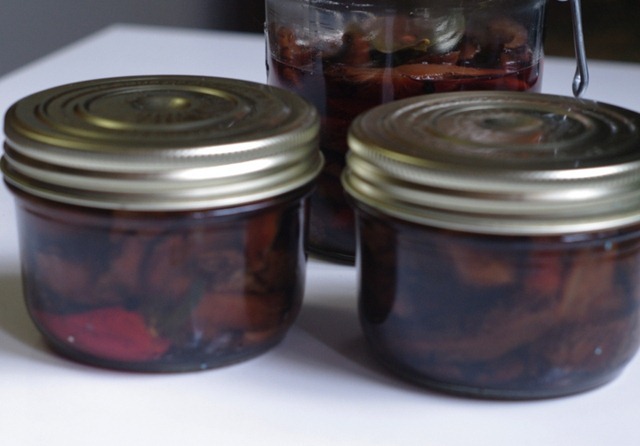 When the mushrooms were cooked I drained them well on kitchen paper and packed them into the jars. Finally, I covered them with the vinegar mix and put the sealed lids on. I haven’t made these before but I think they’ll be nice dressed with olive and eaten as tapas. After this I was hungry but hadn’t planned anything for lunch so I made Mediterranean style oeufs en cocotte, with olive oil instead of butter and some crumbled blue cheese on top. 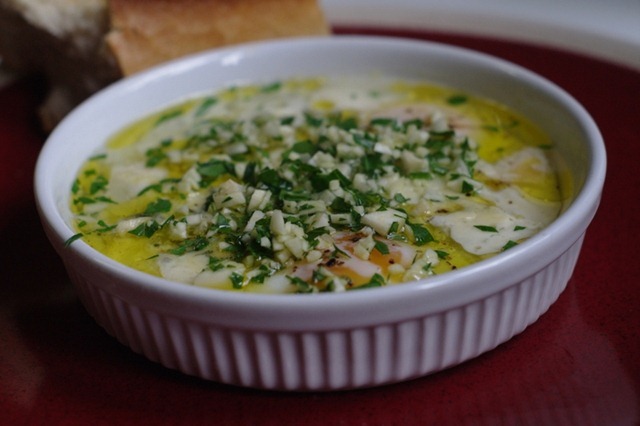 It worked, garnished with chopped parsley and garlic, of course! This entry was posted in mushrooms, olive oil, olives by chaiselongue1. Bookmark the permalink. yes, there’s a view of the village from there and the avenue of olive trees leading to the entrance is a nice touch. Apparently the olive yield has been low everywhere this year. It will be nice to have some of your own oil, though, even if it’s less than last year. We’re very lucky, and it is excellent oil. I’m with Celi, having locally produced olive oil available would be wonderful! Your pickling of the mushrooms has inspired me. Next September, when the puffballs appear in Michigan, I’m going to try pickling some. They’re so huge and it would be better to preserve some rather than binge on them for a week or so. Thanks for pointing me in that direction. I’m looking forward to your post on pickled puffballs next autumn! Thank you for the egg idea. Looks wonderful.